The Frilight Pinto 8675 boat and RV light operates on 12-24 volts and comes with Halogen or LED bulb and an optional switch. 1/4 in. recessed bezel, patterned plastic diffusing lens and colorful finish options make the Pinto an affordable and dynamic choice for boat, RV, and 12 to 24 volt lighting needs. Optional switch for easy control of light's Halogen or LED bulb. 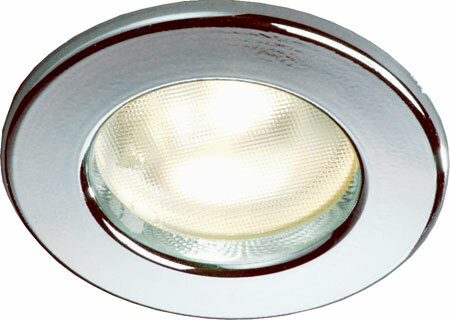 Select energy efficient 10 SMD G4-pin LED or G4-pin Halogen Bulb. LED functions on inputs of 10-30 volts DC while the Halogen bulb functions on 12 volts. Replacement trim ring for the Pinto 8675 available here. Glass Replacement lens for the Pinto 8675 available here. 160 Lumen Warm White, 190 Lumen Cool White, Blue, Red, and 3-Way Dimmable LEDs available. These lights are the exact ones Meridian used when building the boat. Therefore, it was easy to match and install 2 additional lights where we needed more light. By using your 24V LEDs we now have a well lit vanity area in our master state room. Perfect lighting fixtures for our motorhomes! Reasonably priced, fast delivery and not to mention their customer service at Sailor Sam's is the best!